The obesity epidemic facing the world today is almost entirely due to a single factor – excessive calorie intake through food. A sedentary lifestyle further contributes to weight gain. Carbohydrates constitute the largest part of our diet and naturally it is the predominant source of calories. The problem lies with refined carbohydrates which deliver more calories ounce for ounce than unrefined carbohydrates. Processed foods are often laden with these refined carbohydrates and often we are unknowingly consuming large quantities of calories in small morsels of food. Sugars are just one type of carbohydrate known for its sweet taste. 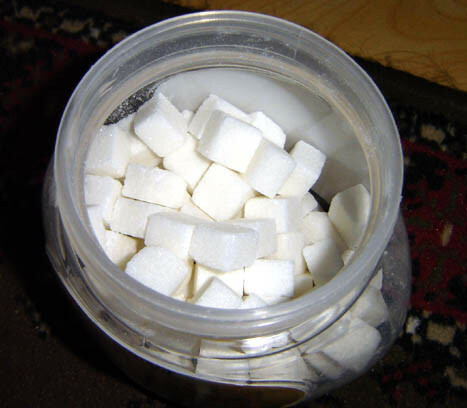 In turn there are many different types of sugars although most of us tend to think of table sugar (white or brown) variety when we hear the word. This refined sugar is produced from sugarcane or sugar beets. Some natural sugars like fructose are found in fruits and certain vegetables. But it is the refined sugars which are added to foods that are the bigger problem. Excessive sugar intake contributes greatly to overall calorie consumption and therefore obesity. These are only some of the risks associated with obesity and a sedentary lifestyle. Many of these conditions in turn may lead to complications which could have life-threatening consequences. It is important to read the labels of food packaging very carefully. Sometimes the sugar content in foods that do not seem all that sweet can be surprisingly high. Consider your sugar intake in line with your daily calorie quota. The average adult male needs about 2,500 calories daily while women require about 2,000 calories per day. If you are trying to lose weight then you should be consuming lesser calories in a day. Here is what teaspoons and grams of sugar equates to in calories – 1 teaspoon of granulated sugar (approximately 4 grams) contains 16 calories. Now consider that a 12 ounce can of some sodas have as much as 33 grams of sugar (about 8 teaspoons). With modern eating habits, it is not difficult to surpass the daily calorie intake particularly with a diet high in processed foods and beverages. High if there is over 22.5 grams of sugar per 100 gram portion. Medium if less than 22.6 grams but more than 5 grams of sugar per 100 gram portion. Small if 5 grams or less per 100 gram portion. We are often told that our largest meal in the day should be breakfast since we need to refuel after 8 hours or more of no food intake and to prepare for the day ahead. However, the sugar content in some breakfast foods and cereals may exceed the proportional calorie intake. High on the list of culprit foods when it comes to excessive sugar are some of the prepared muffins, muffin mixes, breakfast cereals and cereal bars. One cup of some cereals can the equivalent of 4 teaspoons of sugar. A single muffin (some prepackaged varieties) can have about 8 teaspoons of sugar. Some oatmeal cereal bars can have the equivalent of 5 teaspoons of sugar. Fruit naturally contains its own type of fruit sugar known as fructose. But when it is canned or processed in other ways, there is the additional refined sugar added to it. Although we think of fruit as a healthy food, the excess sugar within the canned and processed options can do more harm than good in the long run. One small serving cup of apple sauce can have ab0ut 6 teaspoons of sugar within it. A small serving cup of sliced or diced fruit in light syrup may contain between 4 to 5 teaspoons of sugar. Some fruit sorbets may contain as much as 7 teaspoons of sugar within a small serving cup. Most of us known that snacks and desserts are laden with sugar and high in calories. But we do not realize just how much sugar there is and think that a small portion will not make much of a difference. What may seem like a mid-meal or evening treat can quickly mess up your diet and contribute to weight gain if it is a daily occurrence. A 4.5 ounce piece of apple pie or chocolate creme pie has about 10 teaspoons of sugar. One chocolate fudge pop tart may contains around 5 teaspoons of sugar. A single ice cream cone of the low fat variety has about 4 to 5 teaspoons of sugar within it. Adding sugar to a beverage is one thing. But when drinks that may not taste as sweet are full of sugar then you could be piling on the calories without even knowing it. The problem is that many of us drink some beverage or the other more than we drink water in a day. In fact, some flavored water can be packed full of sugar as well. A 16 ounce serving of chocolate milk can contain as much as 12 to 13 teaspoons of sugar and that includes the low fat variety. Store bought lemonade may have 7 teaspoons of sugar within an 8 ounce portion. Some brands of vitamin water may contain 9 to 10 teaspoons of sugar in a 20 ounce bottle. It may seem strange to pair sauces and yogurt together but the fact is that these are some of the most unsuspecting foods when it comes to high sugar content. With sauces, we all tend to believe that we are eating so little so the sugar intake cannot really matter. And we all think yogurt is one of the main health foods when we choose the fat free variation. Unfortunately this may not be the case. Just half a cup of spaghetti sauce has about 3 to 4 teaspoons of sugar. Two tablespoons of honey barbecue sauce contains over 4 teaspoons of sugar. A 6 ounce serving of frozen yogurt has as much as 7 teaspoons of sugar and that is the 99% fat free variety.